Craneware is the market leader in developing software and providing professional services which help US-based healthcare providers improve their profit margins. This means Craneware’s clients can continue to invest in better outcomes for their patients. As part of a wider programme of communicating success across the 250 Craneware employees located in the UK and the US, it became clear that a new intranet was needed. The existing intranet was impeding smooth communication and the flow of everyday knowledge around the company. Employees were complaining that it was hard to find content either via the intranet navigation or through search. And, if they were lucky enough to find the item they needed, it was often out of date. Ultimately, many had lost confidence and trust in the intranet and its content. A new solution was needed and a relatively rapid deployment was preferred. Content Formula’s consultants recommended deploying Wizdom’s SharePoint intranet-in-a-box solution. With a rich set of features to enable publishing and collaboration, Wizdom was the perfect solution to deliver an attractive state of the art intranet, while unlocking the value of the company’s continuing investment in its on-premises installation of SharePoint. Wizdom’s intuitive interfaces, powerful templates and sheer flexibility meant the intranet would be far easier to manage going forward, resulting in both a successful and sustainable platform. To gain a deep understanding of how staff at Craneware work and how a new intranet might help, Content Formula’s consultants carried out two workshops, one involving a cross-selection of users and another with senior stakeholders. This was supplemented by one-on- one structured interviews with individuals from across the business, both based in the US and the UK. 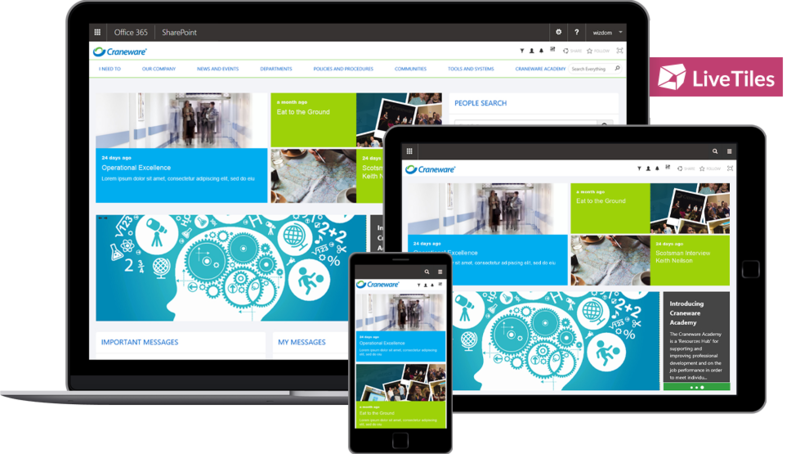 Our consultants soon built up a detailed picture of how the new intranet could help Craneware meet its strategic objectives and allow employees to meet their everyday goals. We presented our findings and associated recommendations back to the core project team and senior sponsors. Our accompanying report included the results of our discovery exercise, which not only highlighted issues with findability but also other areas of frustration. Synthesising the useful feedback and ideas received from staff, we also suggested key areas of the new intranet that would have a real impact. We recommended taking a holistic approach which wasn’t just about deploying new technology but was also about improving content governance, managing search and developing a new information architecture. With most of our recommendations taken on board, our consultants supported the team at Craneware to structure the site, build the basic architecture, design a new user-focused global navigation, and design key pages (with the aid of wireframes). We were also on hand to advise on overcoming some technical challenges. The result is a beautiful SharePoint 2016 on premises intranet which slots seamlessly into the way Craneware employees work. At last it’s easy to publish news and success stories which can be targeted to individuals based on their profiles. The content also renders beautifully on to mobile devices via responsive design. Staff complaints about not being able to find content are massively reduced. A user-centric navigation and a search which can be filtered by subject, content type and other data means employees can find the content they need. Automatic reviews and convenient publishing templates also ensure content owners can keep their pages up to date. Confidence in the intranet and its content has been restored. And, for the first time, employees are also using the powerful collaboration tools within SharePoint – critical when teams are working across different continents! The intranet is helping Craneware to work more efficiently. Of course, it’s still early days for the intranet, but the huge improvements over the previous intranet are clear. More staff are using the intranet, senior stakeholders are fully behind it and the intranet team are excited about the opportunities for the future which the new intranet provides.